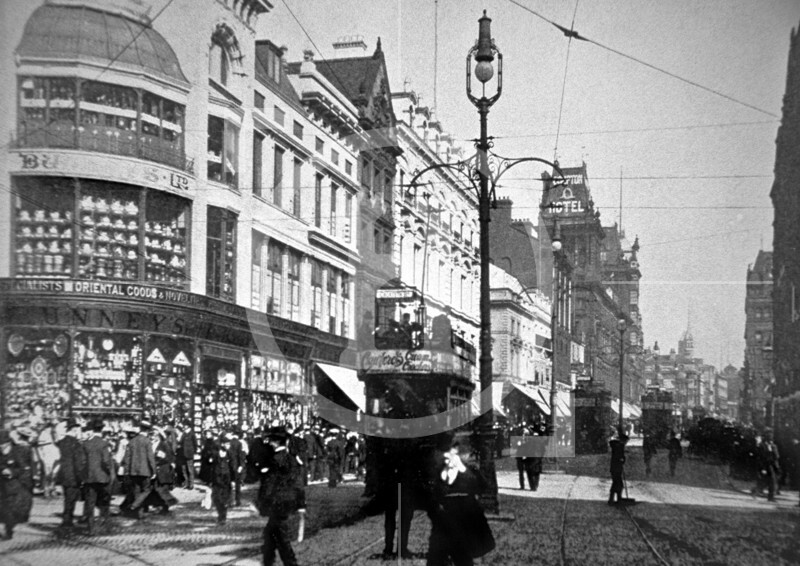 On the left of the photograph is Bunney's Department Store at the corner of Whitechapel, popularly known as Bunney's Corner. Until well into the 1800s, shops were few and far between and often little more than converted front rooms of houses. In the last quarter of the 18th century, Church Street was mainly residential. There was a grocer's shop where Compton House was later built and, on the opposite side, a confectioner's shop at the corner of Church Alley. One of the houses was converted into a tavern, and the site where the first Athenaeum was established was an orchard or garden with a fishpond which in winter was sometimes used for skating.